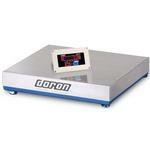 Now you can benefit from Doran’s decades of experience in the design and manufacture of baggage scales. Doran was the first to introduce the revolutionary Full Bagwell Low Profile Base that allows for accurate weighing, ease of installation and exceeds the durability required to handle baggage. 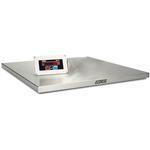 Doran’s DBS scale offers the best solution to your baggage weighing needs. Outstanding Durability & Reliability A side load and vertical load protection system using rubber shock mounts prevents load cell sensor damage from impact and massive overloading as baggage is loaded onto the scale platform. An advanced electronic design prevents damage caused by electrostatic discharge present in dry airport environments. 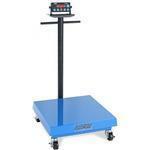 Easy to Operate Baggage weight is easily read from up to 20 feet on the large and bright red LED display. When baggage is placed on the scale, the displayed weight quickly stabilizes on the main and optional remote display to support fast passenger check-in. An optional remote switch control box is available to provide ticket agent scale control closer to their station. Quick and Trouble-Free Installation The modular design of the DBS makes installation a snap even in a variety of bagwell sizes and counter configurations. The entire scale electronics is contained in the panel mount Main Display – no additional electronics control box to install inside the counter. Simply install the Main and Remote Displays into counter cutouts and connect the foolproof, keyed and locking connectors from the base to the main display unit. After routing cables through the counter, strain reliefs ensure that once the cables are connected, they stay connected. A Variety of Base Sizes are Available Custom base sizes are available to fit your exact bagwell dimensions. For new or retrofit installations, the Full Bagwell Low Profile Base can easily be installed right on top of any bagwell design. Doran also offers the Standard Recess Mount Base for bagwells designed for recess mounted scale bases. The affordably priced Curbside Baggage Scale offers the same reliability and durability as our other Baggage Scales in a rugged, portable design. Portable and Affordable The affordably priced Curbside Baggage Scale offers the same reliability and durability as our other baggage scales in a rugged portable design. Guide it to the work area with the 36"-tall column with handles and then anchor it in place with the four swivel and locking casters.